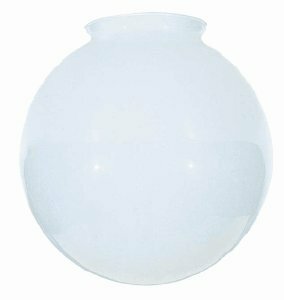 8-Inch White Glass Globe - 4-Inch Fitter Opening This best-selling white glass globe can be used as a component for new fixtures or a replacement for old favorites. Ample light shines through the opaque white glass, providing bright overhead illumination. It measures 8 inches in diameter and has a 4-inch fitter. Metal base not included.. Satco Lighting 8-Inch White Glass Globe - 4-Inch Fitter Opening Lamp.